Today we have a flashback to a few weeks ago when a team out of the Midwest made the trek to Northern California. So let’s start with a very important question: What makes a good volunteer team good? The team calls themselves the Fishermen. They took their name from Jesus bidding, “Follow me and I’ll make you fishers of men.” They’re a team full of love and devotion, setting out to do the work the Lord called His people to do. For the Fishermen, they have quite a few people with construction knowledge, so it only makes sense that they’d like to do their fishing where building is needed. As a matter of fact, most of the team members have already worked here in Lake County at least once. Ken Troutman, who organizes the teams, has been here six times in the last three years. “This place just really speaks to my heart and I want to help at Hope City whenever I can,” Troutman said. This trip, Ken brought his grandson Jeffrey, who has been working alongside him on the various projects. 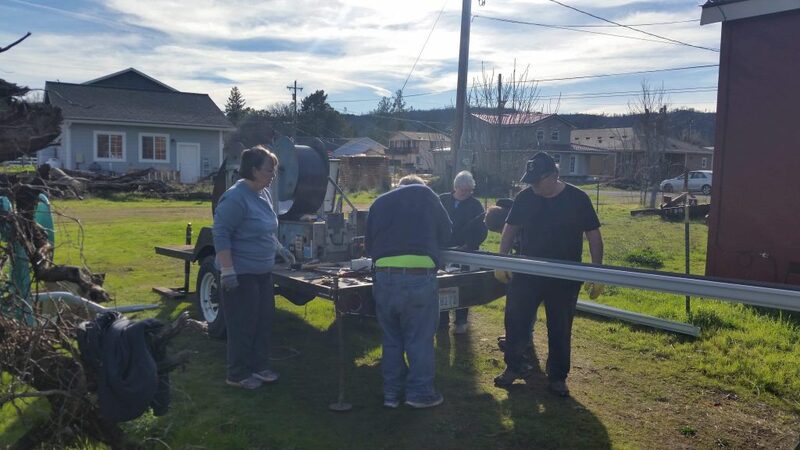 The Fishermen team got to work on six different sites during their time here at Hope City. 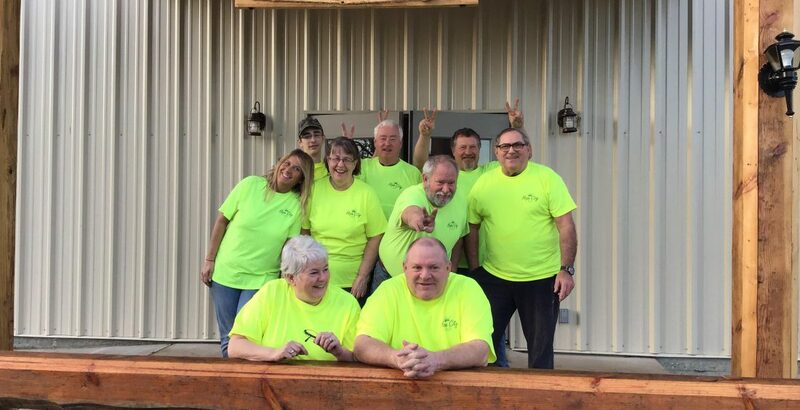 We had a rain gutter team that managed to work on four homes, and they were led by a Hope City volunteer veteran in Terry Keck. 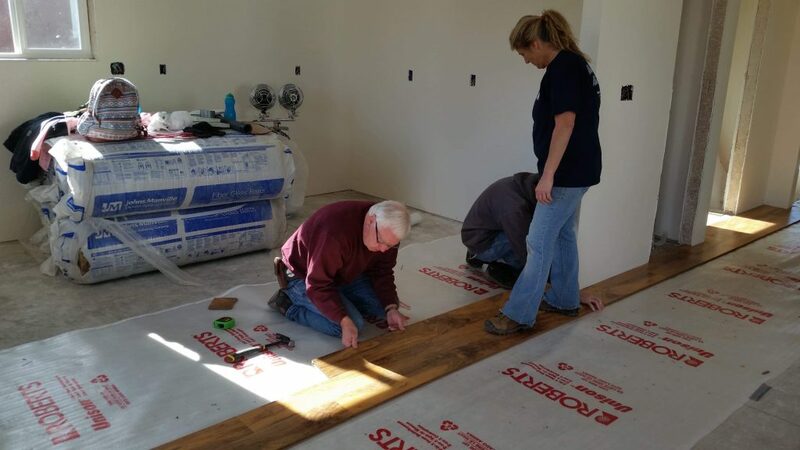 Another team was assigned to flooring on Mickey Thibodeau’s house. Those of you who have been reading Inspiring Hope stories over the last year will be familiar with Mickey and his ADA compliant home. The team flew out of Chicago in the nick of time. As they were making their preparations to leave, a major cold front, complete with snow, rolled in and threatened to delay their journey. In fact they were delayed on the tarmac for about an hour while their plane was de-iced. We don’t mention it as a major selling point, because the work we do speaks for itself, but another benefit of working in Northern California this time of year is day temperatures reaching 60 degrees Fahrenheit. The Fishermen team is a good mix of new and returning Hope City volunteers. Tina Graham is on her third trip to Lake County, and the main camp for Hope City. She loves to volunteer and regularly serves in disaster areas, often joining the clean up teams. She says she is blessed to be able to serve God by helping others. Then there are the first timers in Tom and Gina Harmon. Tom is a business owner with a flair for cooking. His incredible homemade cinnamon rolls are tough to beat, but they’re nothing compared to his macaroni and cheese. So what makes a good volunteer team good? 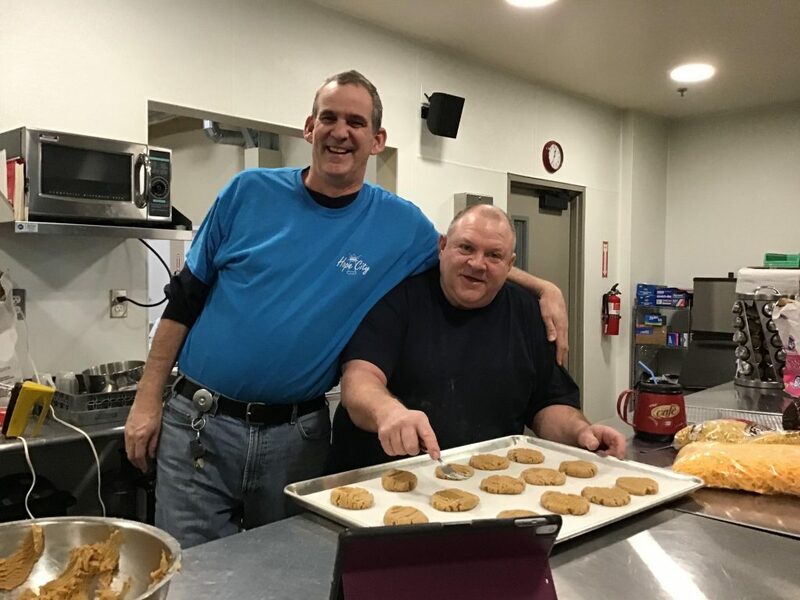 Being given projects they can handle and complete, fresh hot meals after a long days work, and a chance to relax and enjoy fellowship with each other. Good Work, Good Food and Good Rest: the three promises we make to every team who comes through our camp. Thank you for being fishers of men and being a part of Rebuilding Homes and Restoring Lives!